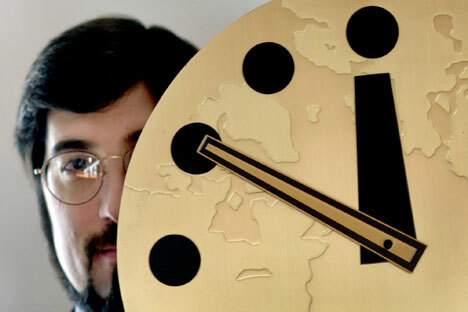 Last month, the doomsday clock's hands were moved a minute closer to midnight by the Bulletin of the Atomic Scientists, the respected global organization that for decades has tracked the risk of a nuclear-weapons catastrophe, whether caused by accident or design, state or terrorist, fission bomb or dirty radiological bomb. Few around the world seemed to be listening. The story — as others like it since the end of the Cold War — came and went within a half-day's news cycle. But the bulletin's argument was sobering and demands attention. Progress since 2007 — when the clock's hands were last set at five minutes to midnight — has stalled, and political leadership has gone missing on all of the critical issues: disarmament, nonproliferation and key building blocks needed for both. On disarmament, the balloon has well and truly deflated. The New START treaty, signed by the United States and Russia in 2010, reduced the number of deployed strategic weapons, but left both sides' actual stockpiles intact and their high-alert status undisturbed. What's more, nuclear weapons modernization programs are still in place in both countries, and disagreements about missile defense and conventional-arms imbalances remain unresolved. With no further movement by the United States and Russia, which together hold 95 percent of the world's total of more than 20,000 nuclear weapons, no other nuclear-armed state has felt pressure to reduce its own stocks significantly, and some — China, India, and Pakistan — have been increasing them. Proliferation Treaty box, and Iran is closer than ever to jumping out of it with consequences that would ricochet around the region — and the global economy — if it makes that decision. Despite U.S. President Barack Obama's good intentions, the Senate is no closer to ratifying the Comprehensive Nuclear Test Ban Treaty, while China, India and Pakistan, among others, take shelter behind that inaction. A fragile voluntary moratorium is the only obstacle to resumed testing. And negotiations on another crucial building block for both disarmament and nonproliferation — a treaty to ban further production of weapons-grade fissile material — remain at an impasse. The only somewhat good news is that progress continues on a third building block — ensuring that weapons-usable materials and weapons themselves, currently stored in multiple locations in 32 countries, do not fall into the hands of rogue states or terrorists. At the end of March, South Korean President Lee Myung-bak will host a follow-up meeting to Obama's successful Nuclear Security Summit in 2010, which brought together 47government leaders to agree on a comprehensive program aimed at securing all such materials within four years. High on the agenda will be the security implications of nuclear safety. The Fukushima catastrophe showed that nuclear power plants may be vulnerable to natural disasters, but they may also be susceptible to terrorist sabotage. Nuclear security is only one small part of what must be done to eliminate nuclear threats once and for all, and summit fatigue will make it difficult to sustain key world leaders' commitment to meeting for so narrow a purpose. New thinking is urgently needed on how to recover the momentum of just two years ago. To achieve that requires meeting three conditions. First, political leaders and civil society leaders must restate, ad nauseam if necessary, the case for "global zero" — a world without nuclear weapons — and map a credible step-by-step path for getting there. Second, new mechanisms are needed to energize policymakers and publics. One is to develop and promote a draft Nuclear Weapons Convention as a framework for action. Another is a "state of play" report card that pulls no punches in assessing which states are meeting their disarmament and nonproliferation commitments, and which are not. The Nuclear Materials Security Index, recently published by U.S. Senator Sam Nunn's Nuclear Threat Initiative, is one example. Advocacy-focused leadership networks, such as those now operating in Europe and the Asia-Pacific region, comprising well-known former leaders and other senior figures, could also help. Third, sustaining high-level policy attention to the entire nuclear agenda requires an institutional setting. The Nuclear Security Summit's focus is too narrow for this role, and the International Atomic Energy Agency's formal mandate is too restricted. The Non-Proliferation Treaty Review Conference meets too irregularly, and the United Nations Security Council's membership is too limited. The best forum for norm-building may prove to be the Group of 20, whose members embrace both North and South, account for most of the world's population, gross domestic product and all but a handful of its nuclear weapons, and whose heads of government meet regularly. With its foreign ministers meeting in Mexico this month to discuss broader global governance issues, the G-20 is beginning to move beyond a narrow economic focus. That is to be welcomed. Economic destruction causes immense and intolerable human misery. But there are only two global threats that, if mishandled, can destroy life on this planet as we know it. And nuclear weapons can kill us a lot faster than CO2.